The Clutha River is Aotearoa’s largest river (by discharge). It is a lifeline for communities in the dry Central Otago region, providing potable water and crop irrigation, with tourists marveling at its dark blue to turquoise water. Snowmelt and recent rains have caused changes to the colour of rivers in Central Otago, as shown in the satellite images presented here. On Saturday, 3 November the Clutha appeared dark blue (above), whereas by the 13th is was more like turquoise (below). The Manuherikia River flows into the Clutha and is brown from silt run-off within its catchment. The confluence of the Manuherikia and Clutha rivers at Alexandra is marked by a sharp contrast in colours, but not much effect on the downstream colour of the Clutha. On Friday, 23 November (the next occasion the Sentinel-2B satellite passed overhead) much of Central Otago was covered in clouds, but luckily there was a gap in the clouds through which the confluence appears (left). Here, the much-increased flow of the Manuherikia is obvious from its penetration into the Clutha, and downstream the entire Clutha runs brown due to the mud carried by its tributary. The discoloration of the Clutha downstream of Alexandra demonstrates the connective power of water – from the high country down to the lowlands, estuaries and coastal waters. 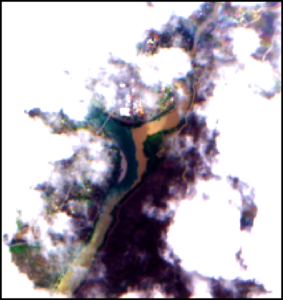 We reviewed images from when Sentinel-2B passed overhead on 28 November and could see clearly that the discolouration from the Manuherikia discharge had dissipated. 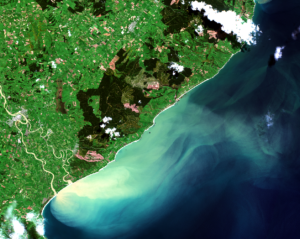 10 November 2018 – Clutha River sediment discharge emptying into the Pacific Ocean 75 kilometres south west of Dunedin. CSST is delighted to announce their role in facilitating their first international space mission partnership, as a calibration and validation (cal/val) partner for the NASA ECOSTRESS mission. ECOSTRESS is a scientific mission that will measure the temperature of plants and use that information to better understand how much water plants need and how they respond to stress. The ECOSTRESS instrument, which is roughly the size of a refrigerator, is installed on the International Space Station. It captures temperature measurements of the Earth’s surface and sends the data back down to Earth. The New Zealand cal/val partnership brings together researchers from University of Waikato, Manaaki Whenua – Landcare Research, and the National Institute of Water and Atmospheric Research (NIWA) to provide ECOSTRESS with essential ground measurements from New Zealand. The partnership was formed when CSST reached out to NASA’s Jet Propulsion Laboratory (JPL) after identifying a unique opportunity for New Zealand researchers to contribute to ECOSTRESS. CSST liaised with JPL to understand the project requirements and has facilitated the collaboration of researchers from the three local partner organisations. Each of the New Zealand partner organisations manage ecological research sites throughout our country, where tower-mounted sensors measure the exchanges of carbon dioxide, water vapour, methane, and other gases – exactly what is needed to calibrate and validate space-based measurements from ECOSTRESS. Work is now underway at JPL to calibrate and validate the preliminary ECOSTRESS science data by comparing the spaceborne measurements with similar measurements made at ground control sites around the world. This quality control process is a critical component of all space-based missions and ensures that remote observations can be reliably tied to what is actually happening at the ground-level. “The CSST and New Zealand researchers have established an important network of ecosystem measurements across a diverse landscape. This is important not only for understanding New Zealand’s rich ecology, but also for helping NASA to calibrate and validate similar measurements from space by ECOSTRESS,” said JPL scientist and ECOSTRESS science lead, Dr Joshua Fisher. By contributing to this mission, New Zealand researchers are playing a key role in both advancing scientific understanding of how plants use water; and enabling water managers, farmers, and policy-makers to utilise that data for better decision-making. Ultimately, this information could be used to protect the world’s vulnerable ecosystems while increasing agricultural yield and optimising forestry management. “We are excited to be working with the New Zealand team and look forward to doing more work with them in the future,” said JPL scientist and ECOSTRESS calibration/validation lead, Dr Kerry Cawse-Nicholson. “We hope that this is the beginning of many science partnerships with key international space actors,” said Steve Cotter, CEO of CSST. If someone in your care is sick, one of the first things you’ll do is take their temperature. Our bodies have a natural “thermostat”, and when our temperature deviates from this norm, we know something is wrong. In the same way, plants carefully regulate their internal temperature to stay healthy, and we can measure this temperature from space to monitor their health and mitigate environmental stressors. As plants open their pores to take in carbon dioxide for photosynthesis (i.e. grow), water is simultaneously released through evapotranspiration. This helps them cool down, much as human sweat cools us down. But if plants don’t have enough water to release, they can overheat. As a survival mechanism—for example during a hot and dry afternoon—they may close their pores to prevent water loss and consequently halt growth. Thus, plant vitality and yield are inextricably linked to heat stress and water availability. Understanding how vegetation changes due to these stresses is the key science question being addressed by the NASA Jet Propulsion Laboratory (JPL) ECOsystem Spaceborne Thermal Radiometer Experiment on Space Station (ECOSTRESS) mission. The instrument was launched into orbit on 29 June and installed on the International Space Station on 5 July, where it will remain for at least 12 months. Collectively, the New Zealand network of ground sites spans a diversity of land uses and climate, including wetland peat bog, irrigated and non-irrigated agricultural sites, and dairy pasture. This variety of well-characterised mini-environments makes New Zealand uniquely positioned to contribute to global science missions by providing calibration and validation of space-based measurements across ecological zones. Manaaki Whenua – Landcare Research (MWLR) has ongoing projects on the carbon, nitrogen and water exchange of pastures and fodder crops with and without irrigation, as well as projects aimed at optimising irrigation water-use by smart sensing technology. Andrew McMillan, MWLR Senior Researcher said, “this collaboration with ECOSTRESS and CSST provides a great opportunity to take observations made at the sites of MWLR and the NZ partner organisations, and use them to inform the development of space-borne data products that are global in scale but maintain local relevance”. New Zealand committed to ambitious reduction in net greenhouse gas emissions, and the current government aims for net zero greenhouse gas emissions by 2050. Under a new Endeavour science programme “Guiding New Zealand’s Carbon Mitigation Strategies”, NIWA will test the hypothesis that New Zealand’s current reporting methods underestimate land carbon uptake. NIWA is now extending the monitoring of grassland systems to irrigated and non-irrigated systems. Mike Harvey, NIWA Principal Scientist – Atmosphere commented, “I’m excited that this might give us an opportunity for a broader participation in ECOSTRESS now and in the future. We will be starting to look at the interaction between water use, irrigation and carbon in this new programme. It will be interesting to look more deeply into the impacts of irrigation and what governs whether there is net carbon loss or gain compared to dryland”. Dr Christian Zammit, a hydrologist from NIWA said, “the opportunity for our team to partner in this multinational project highlights the depth of local science expertise and resources in New Zealand”. Zammit is leading a programme of work that will create the New Zealand Water Model, a sophisticated computer model framework that will enable users to accurately predict how much freshwater is available, where it has come from, and how quickly it moves through New Zealand catchments. The time series fluxes provided by ECOSTRESS will be used to help develop and validate this model across New Zealand. University of Waikato research programmes that will be contributing datasets to ECOSTRESS span across low-nutrient bog-type wetlands to highly productive dairy-grazed pastures where greenhouse gas exchanges (CO2, methane, nitrous oxide) and water use have been measured for nearly a decade. Associate Professor David Campbell said, “We are excited to be able to provide high-quality ground-level datasets that can help to validate ECOSTRESS across a wide spectrum of natural and agricultural ecosystems. By partnering in this project we hope to gain a new tool that we can use to understand the effects of disturbances, such as droughts, on plant productivity and greenhouse gas emissions in these diverse ecosystem types”. CSST is a regional research institute based in Alexandra, Central Otago. The organisation was established in May 2017 as part of the Ministry of Business, Innovation and Employment’s Regional Research Institute Initiative. The Jet Propulsion Laboratory is a unique national research facility in the U.S. that carries out robotic space and Earth science missions for the National Aeronautics and Space Administration (NASA). JPL built and manages the ECOSTRESS mission for NASA’s Earth Science Division in the Science Mission Directorate at NASA Headquarters in Washington. ECOSTRESS is an Earth Venture Instrument mission; the program is managed by NASA’s Earth System Science Pathfinder program at NASA’s Langley Research Center in Hampton, Virginia. Caltech, based in Pasadena, California, manages JPL for NASA. 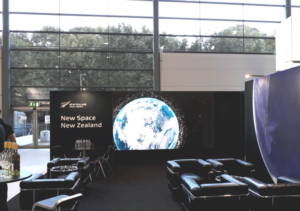 The New Zealand booth at IAC 2018 in Bremen, Germany. Last year, soon after CSST was founded, the first few staff members attended the 68th International Astronautical Congress (IAC) which was held in Adelaide. This year’s IAC was a bit further afield, the host city being Bremen in northern Germany. At the invitation of the New Zealand Space Agency (NZSA), CSST was again represented, though by only one person this time, Dr Duncan Steel. IAC is the main annual gathering of the worldwide space industry, with all the major space agencies and aerospace concerns being in attendance. Also represented are many smaller companies and niche market operators, such as those manufacturing specific electronic components for cubesats, thrusters for satellite station-keeping, or improved GPS receivers ready for the new constellations able to deliver ever-better navigational positions. The global space industry is now reckoned to turn over more than a trillion dollars a year, and the figure is growing annually by over ten per cent. These are boom times for New Space, with an ever-increasing fraction of the activity involving commercial opportunities rather than the governmental space agencies which have been the main spenders since the Space Age began sixty years ago. Capitalising on this rapidly-expanding industry is Aotearoa New Zealand, with the national booth at the IAC stating good and large: New Space – New Zealand. Team NZ consisted of a dozen people, half from the NZSA but also representatives from the universities of Auckland and Canterbury, Venture Southland, LeoLabs (a US company soon to install a space-tracking radar in Central Otago), and of course CSST. What are the returns from travelling around the world to attend? In all there were 6,400 professionals visiting IAC for the talks and presentations on the science, technology and engineering of space. At least another thousand were there to staff the huge exhibition hall. On the Wednesday in the middle of the IAC – October 3rd, German Unity (reunification) Day and so a public holiday – the doors were thrown open for the people of Bremen to take a look at all the space hardware and capabilities on display, and 30,000 locals took advantage of that opportunity. We were able to talk with hundreds of people about the special reasons for collaborating with NZ on space activities: our geographical location (southern hemisphere, nothing eastwards until South America), our active geology, our well-studied environment and agriculture, our small-scale government and thus ability to move quickly, our relatively small land area (but still similar in size to the UK, Italy or Poland) but huge oceanic area of responsibility, and other attractive things about NZ that we tend to forget because we live here. After five days of what felt like non-stop talking, IAC was over, at least until next October 2019 when Washington DC is the venue for the 70th such event. 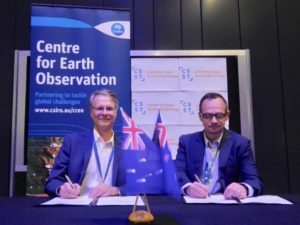 Dr Alex Held, CSIRO’s Director of the Centre for Earth Observation signs the research collaboration partnership agreement with Rafael Kargren, CSST’s Director of Operations in Brisbane, Australia. CSST and Australia’s CSIRO today announced a partnership to jointly solve the complex challenges that arise from the demands and impacts of human activities on the environment, specifically in the South Pacific. CSIRO is Australia’s leading research institute, delivering over $5 billion AUD to the Australian economy each year across a wide range of industries, from farming and food production through to astronomy and space. CSST is one of New Zealand’s newly established regional research institutes, focusing on delivering economic benefit via the application of Earth observation data, remote sensing technologies and geospatial science. The partnership agreement launches a joint research collaboration between the two organisations on either side of the Tasman. Areas of the collaboration will likely include land use, farming techniques, improving crop yield, crop and livestock security, pest control, solutions for water management and disaster monitoring. CSIRO and CSST are already working on earth observation data analytics and processing platforms. In addition to shared methods, New Zealand has unique topology and climate which enables CSIRO to conduct proof of concept work and method validation with CSST scientists, which could lead towards product development that can be applied on a global scale. CSST scientists are leading a number of unique projects such as the work of Dr Moritz Lehmann, CSST’s senior scientist. “Dr Lehmann’s work monitoring lake water colour at a country-wide level is of great interest to our team, and we look forward to collaborating with him to share sensors, tools and knowledge to build a joint expertise across New Zealand and Australia,” says Dr Tim Malthus, Research Group Leader at CSIRO. “We look forward to working together to increase the impact of our two organisations scientific works in the Pacific and globally. The relationship with CSIRO is a valued one for CSST, as there is much to learn from an organisation that has been successfully conducting industry and policy-relevant research across the past century,” said CSST’s Kargren. The CSST and CSIRO partnership was inaugurated in Brisbane on 11 October by Rafael Kargren, CSST Director of Operations and Dr Alex Held, CSIRO Director of the Centre for Earth Observation. CSIRO, the Commonwealth Scientific and Industrial Research Organisation, is Australia’s national science agency operating under the provisions of the Science and Industry Research Act 1949. CSIRO is Australia’s innovation catalyst, collaborating to boost the nation’s innovation performance and aims to create benefit for Australia through impactful science and innovation. CSST is a regional research institute, formed in July 2017 to deliver economic opportunity to New Zealand by conducting policy-relevant, industry-led research and development in the fields of geospatial science and remote sensing. CSST aims to scale the positive impact of EO data by pairing science and product commercialisation. CSST is now the primary provider of Airbus satellite data and products in New Zealand and the Pacific Islands. With science and commercial applications ranging from disaster monitoring and border security through to agriculture and forestry, access to Airbus products increases CSST’s data offerings to include a broad range of satellites, from compact cubesats (which can fit in the palm of your hand) to highly sophisticated radar satellites (size of a bus), used for collecting very-high-resolution data about the Earth’s surface – day or night, rain or shine. Many people pass through our offices in Alexandra from day to day, but nothing like the number who were there on the 16th of August. The large room in the CSST office, after weeks of preparation, became a mission control centre, with a dozen staff from New Zealand, Australian and US companies operating a complex suite of communication systems, flying state-of-the-art surveillance drones from the airfield, and demonstrating how such technologies could be vitally important in civil disasters or military operations – all watched by forty senior decision-makers from the NZ Defence Force, Fire and Emergency NZ, NZ Police, NZ Transport Agency, and a wide range of other governmental and commercial organisations. The Mayor of Central Otago, Tim Cadogan, lit the metaphorical touch paper and the technology burst into life, with a fleet of large drones zipping around the skies from Alexandra’s airport so as to simulate the utility of such a networked system in the case of something like an earthquake, a major road accident, a ship foundering at sea or a big bushfire. The main organisers of the event were SkyBase, a Christchurch-based company which operates UAVs (uninhabited aerial vehicles) carrying a range of sensors for mapping, monitoring ongoing events on the ground, and also providing aerial communications networking for the provision of beyond-line-of-sight operations. SkyBase teamed with MAG Aerospace (a US company specialising in airborne intelligence, surveillance and reconnaissance operations), CIStech Solutions (an Australian provider of radio over internet protocol and networking capabilities) and CSST in order to put on a demonstration of how UAVs could be run from a DNOC (Deployable Network Operations Centre). In essence the idea is that a DNOC could be kept ready for rapid dispatch to some location where aerial coverage would be of vital significance. Having electronic eyes in the sky would enable better choices to be made by commanders. Why Alexandra? Apart from CSST being located there, with suitable office space to become a DNOC for a day, the weather of Central Otago (even in frigid August) gave the best chance for a successful exhibition. All in all, the exercise ran like clockwork. More than that, UAVs like those demonstrated could be of invaluable service to CSST in the future, collecting imagery for tasks such as scanning vineyards to monitor plant health and grape growth, or scanning croplands to assess when fertilisers or pesticides should be applied, and in what quantities. July 30, 2018 – In an exciting new venture, Planet, an integrated aerospace and data analytics company, and New Zealand’s Centre for Space Science Technology(CSST) announce today a partnership to help drive regional economic growth by distributing Planet’s daily, global Earth observation data and analytics. CSST will act as the distribution hub and R&D partner for Planet in New Zealand, making sure a breadth of industries and government agencies get efficient access to Planet’s data and analytic products. Together, Planet and CSST will localise analytics from Planet and jointly develop new solutions to serve specific verticals, including agriculture, disaster management, defence and intelligence, forestry, and maritime. 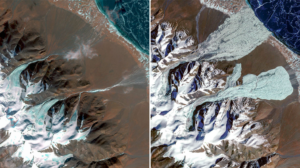 Signs of water pooling on glaciers in Tibet (left) preceded a pair of avalanches (right). 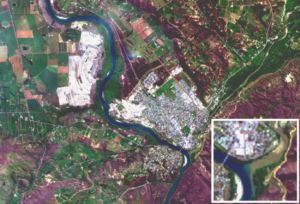 ©Planet Labs, Inc.
Planet’s global daily imagery and analytics will improve decision-making in key sectors of the New Zealand economy, including disaster preparedness and emergency management, agricultural monitoring, forestry and land use monitoring, water management, infrastructure monitoring, and intelligence gathering. 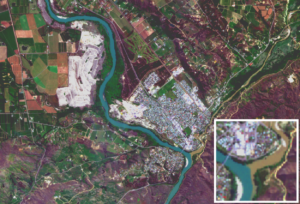 “Earth observation data is becoming increasingly important in helping New Zealand address its biggest economic, environmental, and social challenges. The biggest advantage of Planet’s constellation is how frequently its satellites pass overhead, which is extremely important in the New Zealand context, particularly with disaster monitoring. For example, Planet imagery revealed close to 80,000 landslides in the wake of the 2016 Kaikoura earthquake. Real-time disaster monitoring with Planet data will transform how governments and businesses target preparedness and relief efforts,” said Steve Cotter, CEO of CSST. The partnership will be inaugurated at a roadshow in Wellington on Monday, 6 August 2018, where attendants will get an up-close look at the products and ask questions directly. For more information and to register, visit the Eventbrite page. Planet is an integrated aerospace and data analytics company that operates history’s largest fleet of Earth-imaging satellites, collecting a massive amount of information daily about our planet. Planet designs, builds and operates over 200 satellites, and develops the online software and tools that serves data to users. To learn more, visit http://www.planet.com. Two teams of bright young Kiwis have just presented their space start-up ideas at the ActInSpace international finals in Toulouse, France. The teams competed in ActInSpace NZ, a 24 hour challenge event, or hackathon, on 25-26 May in Christchurch where they were asked to re-imagine uses for space technology and find new applications for space data. The NZ event was one of 71 events run simultaneously around the globe, across five continents and in 35 countries. This was the first year that New Zealand participated in the global ActInSpace event, and was the only country to send two teams to the international finals event in Toulouse, France. Te Mārama, from left to right, Jonah Belk, Mahima Seth, Ben Tairea, Zeus Engineer and Maddy King. The first place team, Te Mārama, was made up of five students and professionals from Auckland, Wellington, Christchurch and Dunedin. The team members, including Mahima Seth, Ben Tairea, Maddy King, Zeus Engineer and Jonah Belk, met on the day of the event and proceeded to develop a start-up business idea that found a solution to reduce dangers and high cost of mechanical repairs on the International Space Station. Their idea, which uses robotics and virtual reality (VR) to remotely repair mechanical faults in the extreme environment, impressed the NZ judges won them first place at the Christchurch event. In the weeks following the NZ event, the team further developed their idea with support from local and international researchers, engineers and technicians at organisations like NASA, the German Space Agency (DLR) and New Zealand’s Centre for Space Science Technology (CSST). 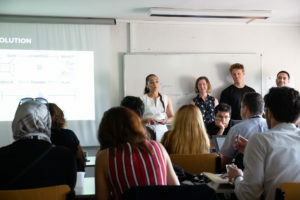 The team was coached by Jon Sandbrook of WNT Ventures, Emeline Paat-Dahlstrom and Eric Dahlstrom of SpaceBase and Pallas Cotter of POP, a strategic consulting company. Te Mārama travelled to France last week and competed in the semi-finals against teams from Australia, Taiwan, Guatemala, Brazil and Turkey. Unfortunately the NZ team narrowly missed out on making it to the finals, coming in a close second to the eventual ActInSpace grand prize winners from Australia. The semi-final judges commented on Te Mārama’s pitch, noting their success in delivering a clear and well-thought through technical solution to a complex problem. “What’s really exciting is their idea can also be applied to the challenging environments on Earth, which present additional opportunities for them,” Mr Cotter added. 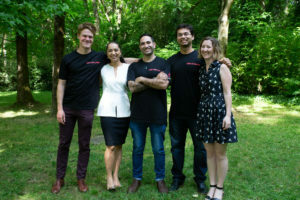 Te Mārama’s idea gained interest from various business incubators and space agencies, which led to many meetings following the finals where they discussed progressing their idea with key organisations in the international space industry. These meetings were organised by the French Embassy in New Zealand. Te Mārama pitching their start up idea at the ActInSpace international semi-finals. Upon their return to New Zealand, CSST and coaches will continue to support Te Mārama, helping connect them to relevant collaborators and partners, as required. The second team that travelled to France for the finals was a group of five high school students from Dunstan High School in Alexandra, Otago. The students, whose team name was “Underage”, pitched their idea of combining global positioning technology with street art and social media at the New Zealand event, earning them a close second place to Te Mārama. Ordinarily only the first place teams from around the world were invited to the finals in France, however, executives from Airbus, one of the global event’s sponsors, were so impressed with Team Underage’s idea and the spirit with which they presented it, they offered the students a chance to pitch their idea at the finals. 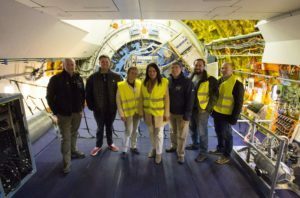 The New Zealand Space Agency, CSST and Airbus all worked together to get them to Toulouse. 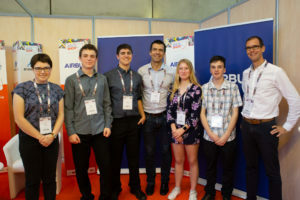 Team Underage with Airbus representatives, Valentin Merino and Martin Pentier. Team Underage were asked to present their pitch at the start of the ActInSpace finals, officially kicking off the event, and reminding the audience of event participants, organisers and sponsors of the true essence of ActInSpace. Coming from a small down on the South Island, the opportunity to travel to France and the heart of the European space industry was a life-changing experience. Andre Schaap and Jake O’Malley pitch Team Underage’s start up idea at the finals event in Toulouse. “The New Zealand Space Agency couldn’t be prouder of what Team Underage have achieved, and we feel privileged to have been able to offer them this opportunity,” said Dr Peter Crabtree, General Manager Science, Innovation and International at the Ministry of Business, Innovation and Employment, and leader of the New Zealand Space Agency who funded the students’ trip. 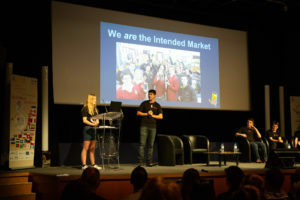 The Dunstan High School students spent the days following the finals meeting with space industry organisations in Toulouse before returning to Alexandra. They will continue to be supported by CSST, New Zealand Space Agency and their team coaches if they wish to pursue their start-up idea, and have already started talking about getting another team together to represent Dunstan High School at ActInSpace 2020. In mid-June Steve Cotter, CSST CEO and Dr Delwyn Moller, CSST Director of Research were invited on board the NASA SOFIA flying observatory to witness space observations from a whole new perspective. 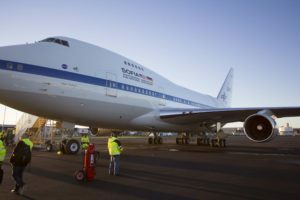 SOFIA stands for Stratospheric Observatory for Infrared Astronomy, and consists of a Boeing 747SP aircraft, modified to carry a 2.5 metre, 17 tonne telescope to altitudes of 14-17 kilometres, above the terrestrial water vapour layer. The SOFIA is based out of Christchurch for eight weeks a year, to study celestial objects best viewed from the Southern Hemisphere. Observations over this year’s flights out of Christchurch include “targets that are too low to observe or not visible at all from the Northern Hemisphere – including our neighbouring galaxy, the Large Magellanic Cloud, the centre of our own Milky Way galaxy, and Saturn’s moon Titan,” according to NASA. Steve and Delwyn were invited on board the SOFIA as special guests on the 22 June flight, along with five others from a variety of organisations across New Zealand, including Air New Zealand. They joined scientists, astronomers and crew on board the 10-hour, overnight flight. Steve, Delwyn and other guests were given a tour of the aircraft, after being briefed by the crew. The observations recorded by the telescope are what helps us learn more about our universe, the Milky Way galaxy, the origins of stars and the characteristics of galaxies beyond our own. Overall, both Steve and Delwyn, commented that they felt honoured to be invited on board the SOFIA, and build a stronger relationship with the team at NASA, as often of the work they do overlaps with ours – finding new ways to collect, process and analyse Earth observation data, and apply those learnings in a way that benefits science, business, government and humanity as a whole. 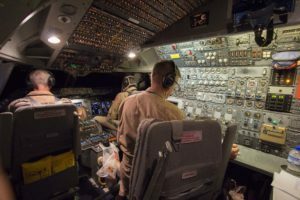 For more information on the NASA SOFIA and the scientific observations being done during its time in New Zealand, visit the SOFIA mission page on the NASA website.